Summer heat, wind-kissed waves, meat sizzling on the BBQ, nothing compares to a classic BBQ under the hot coastal, California sun. 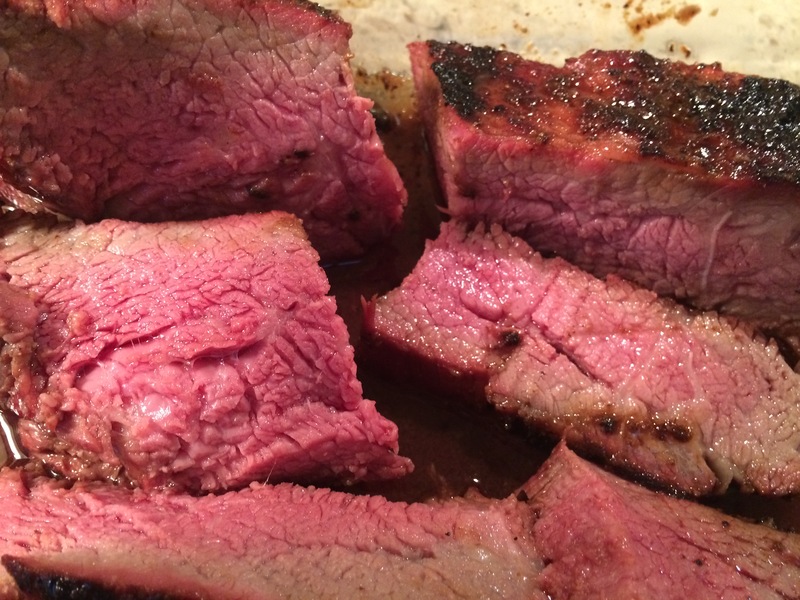 I first encountered the flavorful tri-tip while attending college at Cal Poly State University in San Luis Obispo in central California in the late 1970s. Most of the time I lived in Shell Beach, just a hop and a skip from the birthplace of the tri-tip in Santa Maria. Although common along the west coast this is not a popular cut elsewhere but you may see it as a triangle steak or a bottom cut sirloin steak. 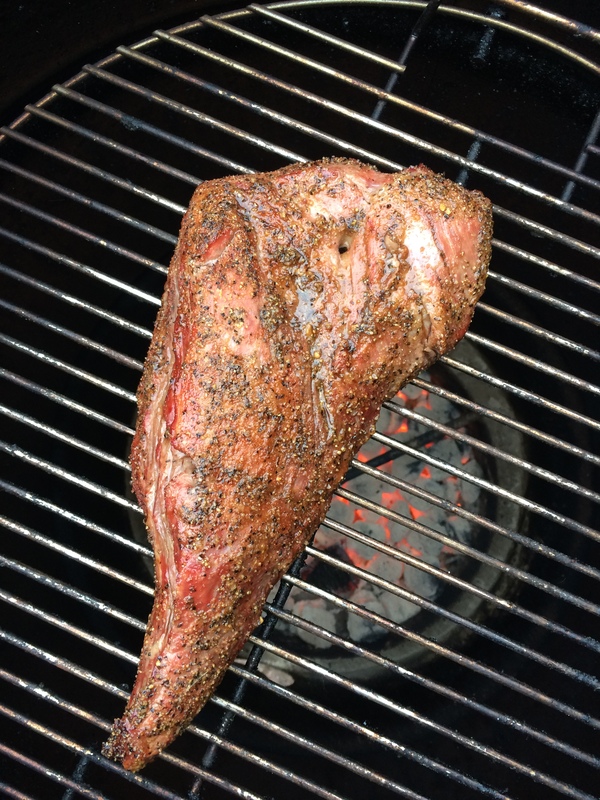 Along the northern California coast, in Trinidad, the tri-tip is the perfect complement to a long day hiking the redwoods and coastal beaches. In is here in Trinidad that I adapted my receipt to the Pit Barrel Cooker, which produces a juicy, flavorful steak within an hour or so. 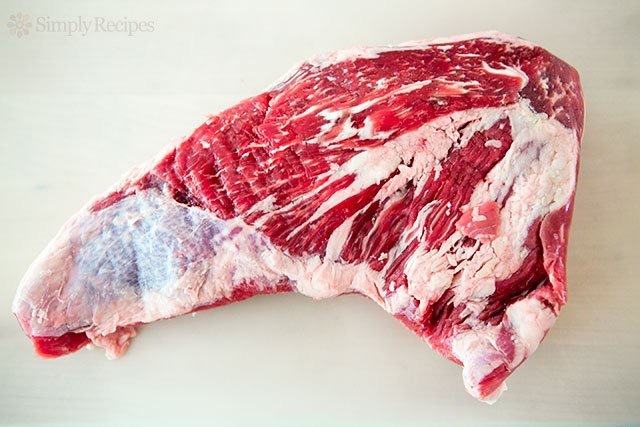 The tri-tip cut: unique to the west coast. So my strategy here is simple: I use a reverse seer to first cook the meat slowly then seer the outside to get that charred flavor. It’s a simple recipe: a rub then basting with a marinade. First, I follow Meathead’s guidelines at Amazing Ribs to salt the meat using Dry Brining, which should happen prior to cooking. 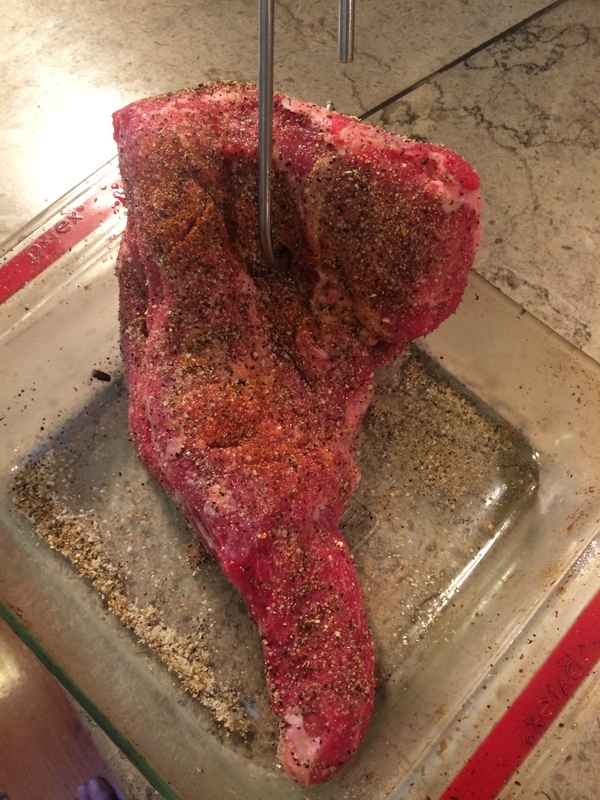 If you want to skip this step just include the salt in with the rub at about 1/2 tsp per lb. meat. Then sprinkle the rub on the meat and coat with olive (or peanut) oil prior to placing in the cooker. 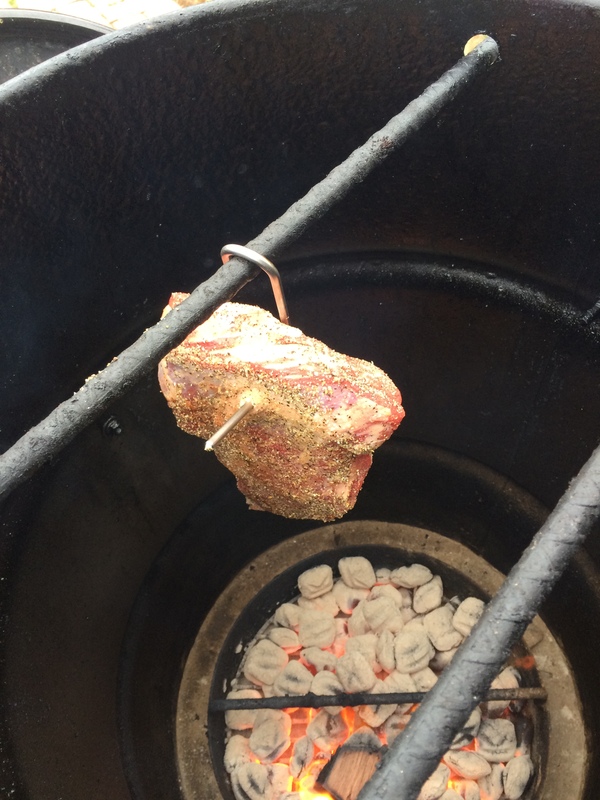 I add a few mesquite wood chunks to the charcoal for flavor but use whatever wood you like. Cook until the internal temperature is about 125F (about 30-40 min) then leave the lid off to crank up the heat and char the meat on the grill grate until you get it the way you want it. Baste the meat with basting sauce as you do this and flip every 5-10 min. If my coals are not doing the trick I drop the grill down to the bottom of the cooker so the meat is just inches away from to coals. It cooks fast so be very careful! Also, you’ll need some heat-resistant gloves to move the grill and handle the meat. 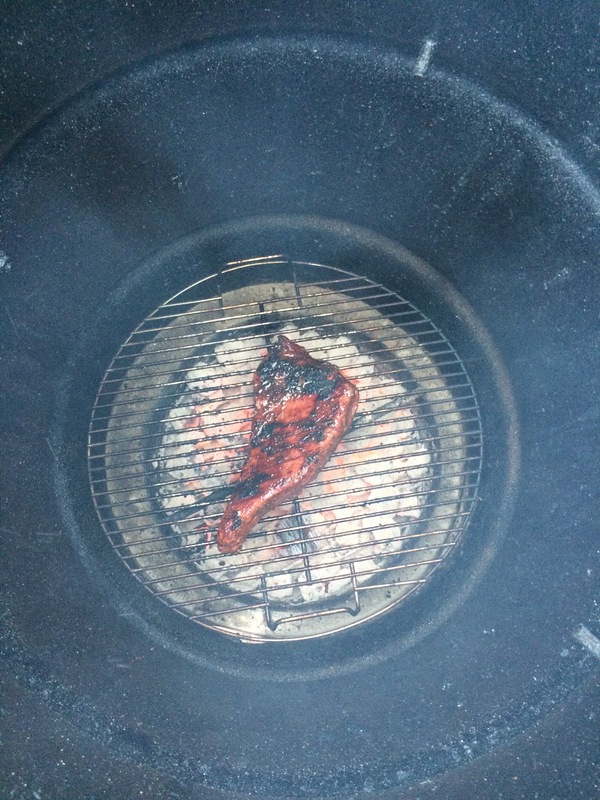 The tri-tip after 35 min. Getting seared on the grill with basting sauce. Dropping the grill to the bottom: be extra careful if you do this but it’s a quick way to get the meat charred. Keep basking and flipping the meat until the internal temperature is what you want, about 130-135 for medium rare, 140-145 for medium and so on. After pulling it off the grill I let it sit for 5-10 min then slice against the grain and serve with extra basting sauce. It’s an easy recipe and fairly quick, usually less than 90 min tops. Enjoy and let me know how you like it! The final product: tender, juicy, wonderful! ← The Rarest Mollusk: an Abalone with No Holes!